On January 19, 2018, Preserve Arkansas hosted its annual Arkansas Preservation Awards dinner and program to honor individuals and organizations for projects focused on historic preservation, education, and advocacy throughout the state. Among the recipients was Joe and Janelle Shell and Adam and Mandi Curtwright of Batesville. The Shells and Curtwrights restored and reopened downtown Batesville’s historic Melba Theater with the help of local businesses and community members. The Melba theater was originally constructed as a mercantile store. It was eventually remodeled in Art deco style and reopened in 1940 to become one of the Arkansas’ first cinemascope theaters. Though the theater closed in the early 1990s, repairs and alterations were made and it reopened in 2000. In 2015, just before the theater had to close its doors again, it was purchase with the goal of renewing this historic treasure. 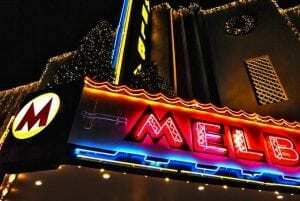 The downtown Main Street business district, which includes the Melba Theater, is included in the National Register of Historic Places. The Parker Westbrook Award for Lifetime Achievement was given to Tommy Jameson, AIA. Little Rock architect Tommy Jameson has a contagious passion for preservation. Tommy has devoted nearly all of his 40 years in practice to working with historic properties throughout Arkansas. He has served on numerous preservation-related boards and commissions, lending his expertise and donating countless hours of his time to the cause. The award for Outstanding New Construction in a Historic Setting was given to the Cameron Bluff Amphitheater at Mount Magazine State Park. Built in 1939 by the Works Progress Administration, the deteriorated Cameron Bluff Amphitheater was rebuilt in 2017 for use by park visitors. The Arkansas Department of Parks and Tourism, McClelland Consulting Engineers, Inc., and VEI, LLC, were recognized with the award. The Excellence in Heritage Preservation Award was presented to the Arkansas Archeological Survey for the “Gathering, Gardening and Agriculture: Plant-based Foodways in the Southeastern United States” fifth grade school curriculum, which uses plants to teach students about culture, history, and economics. The Ned Shank Award for Outstanding Preservation Publication was presented to Shadow Patterns: Reflections on Fay Jones and His Architecture, edited by Jeff Shannon, and published by the University of Arkansas Press in collaboration with the University of Arkansas Fay Jones School of Architecture + Design. Shadow Patterns broadens and enriches our understanding of internationally-known Arkansas architect Fay Jones. The Award for Outstanding Service in Neighborhood Preservation was given to the Park Avenue Community Association in Hot Springs for the Historic Park Avenue Walking Tour. The Association has used this walking tour to increase awareness of the neighborhood’s historic significance and underscore the need for its preservation. • Infrastructure—Springfield Bridge Preservation Project, Conway. The 1874 Springfield Bridge—the state’s oldest bridge—was rehabilitated and relocated to Beaverfork Lake. The Faulkner County Historical Society, City of Conway, Faulkner County, and Workin’ Bridges were recognized with the award. • Residential—Arkansas Democrat Lofts, Little Rock. The original Charles Thompson-designed façade was restored at 615 Main Street and the building’s upper floor creatively reconfigured to house loft-style apartments. 615 Main, LLC, Cromwell Architects Engineers, Moses Tucker Real Estate, and Central Construction Group were recognized with the award. • Commercial—Thompson Building/The Waters Hotel, Hot Springs. This project rehabilitated the 1913 Thompson Building, designed by George R. Mann, and turned it into a 62-room boutique hotel, complete with restaurant, lounge, and sundry shop. TKZ, LLC, Taylor/Kempkes Architects, Jill White Designs, and Harrison Construction were recognized with the award. • Honorable Mention—Lane Hotel/Haas Hall Academy, Rogers. The 1929 Spanish Revival-style Lane Hotel was rehabilitated to serve as Haas Hall Academy, a public charter school. KLS Leasing, LLC, JKJ Architects, and Crossland Construction were recognized with the award. • Infrastructure—War Eagle Bridge, Benton County. The iconic War Eagle Bridge was restored and strengthened to allow for safe passage of local emergency vehicles and to increase the longevity of the structure. Benton County, Great River Engineering, and Crossland Heavy Contractors were recognized with the award. • Nonprofit—Cane Hill College, Washington County. The 1886 Cane Hill College building was stabilized and restored to its original appearance, which involved the careful reinstallation of custom triple-hung windows, paneled doors, and brick matching the original materials. Historic Cane Hill, Inc., WER Architects/Planners, and Kinco Construction were recognized with the award. • Commercial—Isaac Homard House, Little Rock. The distinctive, Neoclassical-style Homard House was meticulously restored after suffering fire damage to serve as commercial office space near the Arkansas State Capitol. Whodunit Holdings, LLC, Polk Stanley Wilcox Architects, and Roystuart Brown Construction were recognized with the award. • Honorable Mention—Lockesburg High School Gymnasium, Sevier County. The 1952 Lockesburg Gym was restored by UA Cossatot employees and is now used for college-wide events and community meetings. The University of Arkansas Cossatot Community College and project manager Mike Kinkade of UA Cossatot were recognized with the award. 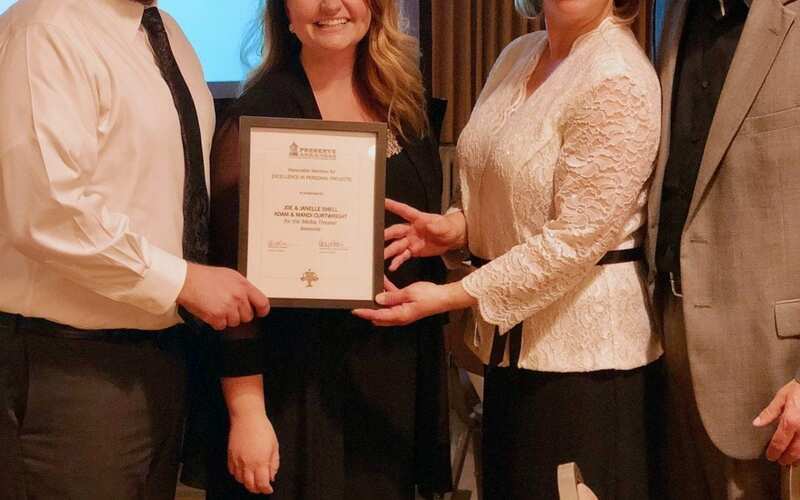 The award for Outstanding Achievement in Preservation Advocacy was presented to the Mosaic Templars Building Preservation Society. The Society was recognized for its 25 years of preservation advocacy, and particularly for its recent work on behalf of the Mosaic State Temple, acquired in 2017 by the Department of Arkansas Heritage. • Zachary Smith and Cheryl Roorda, Hot Springs. Smith and Roorda rehabilitated the ca. 1920 commercial-style building at 236-238-240 Ouachita Avenue in Hot Springs to serve as KUHS-LP, the only solar-powered radio station in Arkansas, and SQZBX Brewery and Pizza Joint. • Chris H. Olsen, North Little Rock. Olsen rehabilitated the Spanish Revival-style Edgemont House in North Little Rock’s Park Hill Historic District to serve as his residence and an event venue with beautiful landscaping. 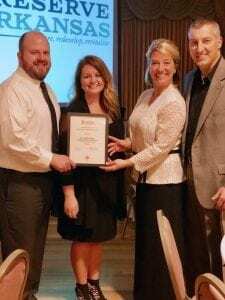 The award for Outstanding Preservation Reporting in the Media was given to First United Methodist Church in Forrest City for the “A Moment in History” radio program, which consisted of several one-minute spots on local radio station KXJK 950 AM recorded by church members. The content included community and church history topics leading up to the 100th anniversary of the sanctuary in November 2017. 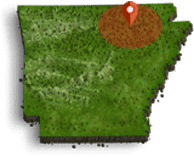 The award for Outstanding Achievement in Preservation Education went to the Arkansas Archeological Survey for the “Bluff Shelters of the Arkansas Ozarks” website. The Survey created a publicly-oriented website to summarize current knowledge about bluff shelters in a visually appealing and approachable format. The website is a much-needed educational resource and promotes the preservation of bluff shelters. An honorable mention for Outstanding Achievement in Preservation Education was presented to the University of Arkansas Fay Jones School of Architecture + Design Department of Landscape Architecture for “If Walls Could Talk: The Story of the Hicks Property.” This project created online interpretation of the Hicks site at Rush on the Buffalo River through documentation of existing site conditions and an ESRI Story Map with an illustrated narrative about Rush and the Hicks family. Honorees and guests celebrated with a reception and banquet at the Albert Pike Memorial Temple in Little Rock, followed by a program recognizing the award-winning projects. Jessica DeLoach Sabin of Little Rock served as Master of Ceremonies for the event. The Awards slideshow and photos from the 2017 Arkansas Preservation Awards are available at PreserveArkansas.org. Preserve Arkansas works to build stronger communities by reconnecting Arkansans to our heritage and empowering people to save and rehabilitate historic places. For more information about Preserve Arkansas or the Arkansas Preservation Awards, contact Rachel Patton at 501-372-4757, rpatton@preservearkansas.org, or visit PreserveArkansas.org.